The book is called The Wild Book, and it’s by Juan Villoro (and it’s translated by Lawrence Schimel, review copy from Yonder Books). It’s about a boy who goes to live with his uncle (who owns a giant library). He soon learns that the library isn’t just an ordinary library – it’s home to the most amazing book in the world, the Wild Book! However, his uncle cannot find it, so he gives his nephew the important job of hunting it down. This isn’t as easy as it seems, though, as the book has a mind of its own. My favourite part was when Juan went to the pharmacy and saw Catalina, in his opinion the prettiest girl ever. It’s funny because boys are so stupid when they fall in love! I would recommend it to maybe girls and boys a little bit older than me (I’m ten) because kids my age would find it a bit boring, without enough adventure and exciting incidents (or basketball…). Maybe it would be good as a young adult book. 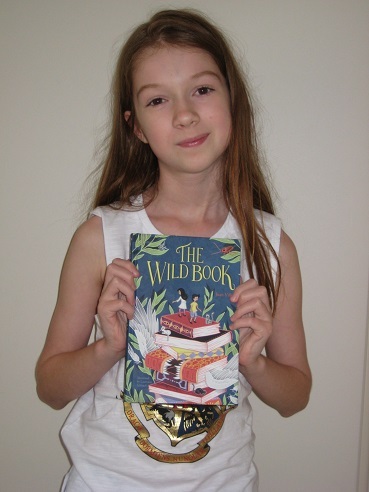 Despite the male protagonist, it’s not hard to see why a bookish little girl might be interested in The Wild Book, with its main character having a special quality that makes books respond magically to him. We’ve all experienced the sensation of being lost in a book, but this is a novel that introduces the idea of the books being lost, and of our having to track them down before we can read them. There’s a reader for every book, and a book for every reader, but if you follow that idea to its logical conclusion, it also means that there are some books that you might not even be allowed to approach. There’s a wistful tinge to the old man’s explanation, and that comes from the reason why he spends his life cooped up with all his books. Regular readers might recognise Villoro’s name from his collection of essays on football, God is Round (a book I enjoyed), and The Wild Book is his first, very successful, YA novel. There’s another first here, too, as it’s the headline release for Yonder, a new imprint of Restless Books specialising in children’s literature (or, as the website has it, ‘Restless Books for Young Readers’). As has been the case with a lot of the books Emily has reviewed, there’s also a top-class translator on the job, with Lawrence Schimel (a *very* accomplished – and busy – man) bringing this one into English, and doing a great job of it too.